This first person stealth action adventure game has often been summed up with “Bioshock meets steampunk”, which is an accurate yet empty description. Considering Arkane Studios helped make Bioshock 2 the resemblance makes perfect sense, yet there is so much more to this game then awesome art and great level design which come to mind whenever Bioshock is mentioned. The game encourages multiple ways to complete each level, and gives you a variety of unique tools to do so. While stealth is encouraged, it is by no means the only way. Combat can be fun and effective (gory beheadings) you can still tell when trying to fight that the game clearly thinks you should try the stealth angle instead (one wrong button press and you’ll be dead). Along with a stellar voice cast (Chloë Moretz, Michael Madsen, Susan Sarandon, Brad Dourif, Carrie Fisher to name a few) Dishonored comes off as one of the sleeper hits of the major fall releases. The setting is the industrial city of Dunwall, somewhat an early 20th century London. Infested with a new plague, the city is in disaster mode; plague rats everywhere, entire sections of city quarantined off, the guards on high alert for people showing signs of plague, people locked in their homes for fear of infection. The once prosperous port town, with a booming whaling industry (whale oil being the prime source of all energy) the once proud capitol city of Dunwall has been brought to its knees. The art and animation during gameplay is very well done, but some cut scenes animation can look ‘choppy’ and will totally take you out of the experience. The city, while in shambles, still looks beautiful. The characters do look a little disproportionate, but that’s mainly due to the animation style and does not take away from the awesome work Arkane Studios did with this games visual greatness. You play Corvo, the Lord Protector to the Empress and her daughter Lady Emily (Chloë Moretz). Upon returning from his mission of visiting neighboring nations in hopes to find help fighting this awful plague (to no avail, they’re just going to blockade you, buncha dicks) Corvo reports this news to the empress, and while speaking privately, a group of assassins appears from out of nowhere (more on that later) kill the Empress and kidnap Lady Emily! As you embrace the Empress during her last moments, the royal guards arrive and catch you literally red handed. During your time in prison awaiting execution, you find out that it was an inside job, executed by those closest to the Empress (also a buncha dicks) in an attempt to take power from her and frame you. This worked flawlessly, because now they have Lady Emily, the heir to the throne hidden away, you’re in jail accused of murdering the Empress and kidnapping the princess, and they simply must remain in charge due to the horrible plague conditions! After many months of interrogation and internment, you receive a secret letter from “The Loyalists” who want to help you escape prison, and in return want your help (see: Assassinate) in restoring order from those who wronged you. Revenge is a dish best served cold. After you break out and meet The Loyalists you are visited in your dreams by a being that is called ‘The Outsider’, a God/Devil who is neither good nor evil, rather neutral, who wants the balance of the empire to be restored. He knows what you’re going to do, and bestows a special set of powers upon you to help you in your quest. The primary of which is the ‘Blink’ ability. Blink lets you move from where you are to where you want to be (about a 20ft radius 30ft with upgrade) in the blink of an eye so you can essentially appear out of nowhere (remember those assassins?). The Outsider also explains to you that scattered across Dunwall are ancient bone charms (collectables) made in his honor long ago that, if collected, will unlock/upgrade more powers for you. There are two different sets of powers, stealth and combat, that you can mix & match to your liking. You can unlock stealth upgrades to see through walls, possess animals & enemies, stop time, and of course blink across space and time. There are combat, or more like physical upgrades, to increase health, jump higher, move faster, attack harder, and overall kill better. There are also another category of charms that you can ‘equip’ for an increase in particular abilities, such as an increase in health/manna, carry bodies faster, more health boost from food. You can only equip so many of these types of charms. There are not enough runes and charms to unlock all powers, so you must decide wisely & early which path you want to pursue. The gameplay plays like Bioshock as well where your left hand controls your powers or ranged weapon with the left trigger, and your right hand controls your stealth executions/knockouts and sword, during combat, with the right trigger. Speaking of executions and knockouts, when sneaking up behind guards you’re given the option of either assassinating them violently (RT) or simply knocking them out with a nonviolent choke hold (RB), R1 & R2 for PS3 respectively. So you can be as destructive or passive as you please. Yet with every kill you increase your ‘chaos meter’. With more kills the more chaos you cause which will lead to a different ending, depending on how passive/violent you are. Every assassination mission gives you a nonviolent option for taking out your primary target, so it is totally possible to go through the whole game without killing a single person. Sometimes the game can get on your nerves, the auto-save points are few and far between, so you must remember to save often, else you be spotted and killed only to start back where you were 15 minutes ago. Guards sometimes have super senses and can spot you from miles away or through cover, and death is a given conclusion at times. With the chaos factor and different endings possible, along with the multiple achievements/trophies awarded for not killing anybody/killing multiple people at once, it definitely encourages multiple playthroughs. The levels are built with this in mind. You can go up and sneak past everybody over the rooftops, on top of ventilation ducts, using blink to skip right past enemies all the way to your target. Or you can go down, possessing rats and running through rat tunnels, possessing people and walking right past unaware enemies, swimming through the water past a checkpoint, even posses a fish and swim to your destination. OR you can go straight in, guns blazing, shooting and slicing your way to victory, killing all who stand in your path. The choice is yours. Regardless of what you chose, you’ll want to do it again the other way, playing each level multiple times, trying different paths, different approaches to each section of a map. This game has a limited number of missions but feels like an unlimited number of ways to complete them. You ARE Corvo, and you want to save Lady Emily and restore order to the empire. This game will take you in with options for everything. Even the options menu has about 20 different sliders to adjust to your liking. Things can be difficult and take you out of the experience, like guards spotting you when you’re clearly covered, a cut scene character gliding across the ground, inevitable death repeatedly. 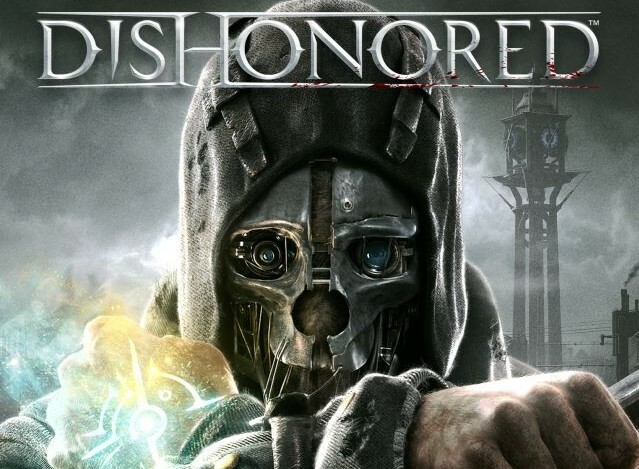 All in all Dishonored is a fantastic game with a great stealth system where the powers have to be earned, not given, making it much more fun when you sneak up behind a group of three guards, execute the first, stop time as another fires a pistol at you, posses the other and move him in front of the pistol, then quick blink behind the pistol shooter as time resumes. He can’t understand how he just shot his buddy, baffled, you slit his throat.